This gallery showcases a variety of paving stone ideas covering popular materials used for outdoor patios and walkways. Using pavers for your outdoor living areas is great for those want a DIY project you can do without a lot of knowledge or expense. Take a look at the different paving stone designs for inspiration to create you own beautiful backyard projects. 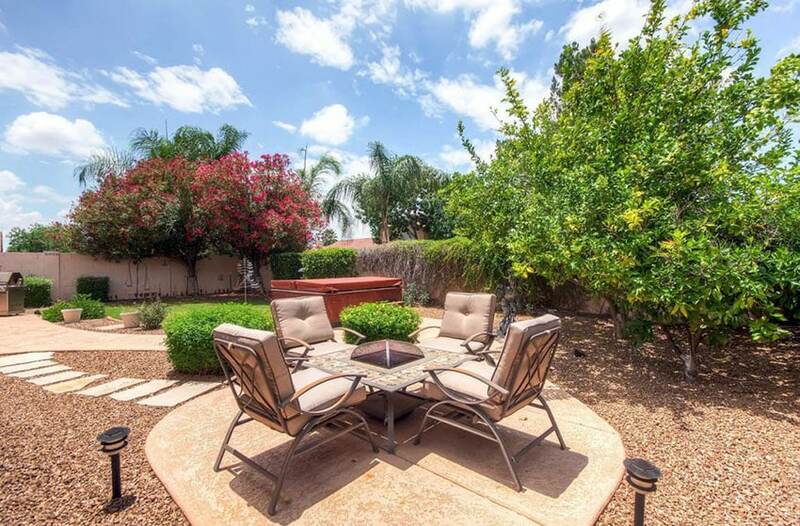 The backyard patio featured in the picture above is a two tier design constructed with concrete paving stones. 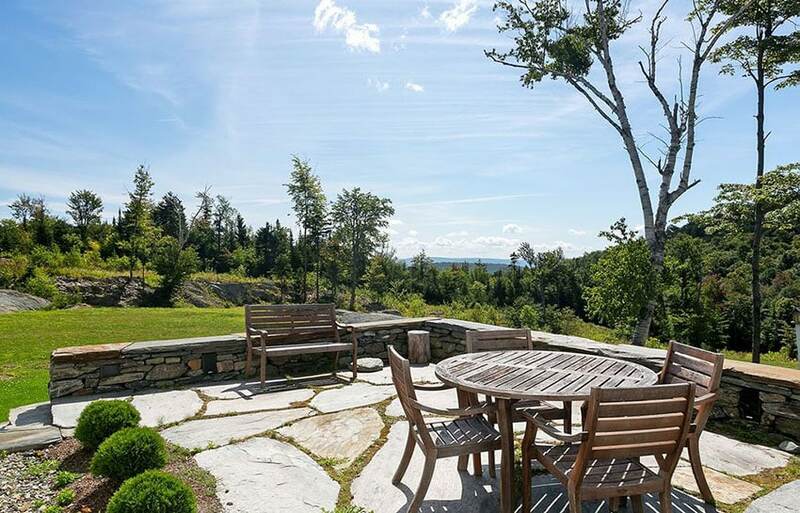 The rough stone firepit is the central focal point with outdoor chairs set up to enjoy the area day or night. Under a small wood pergola rests an outdoor kitchen with a bar made from more rough stone. 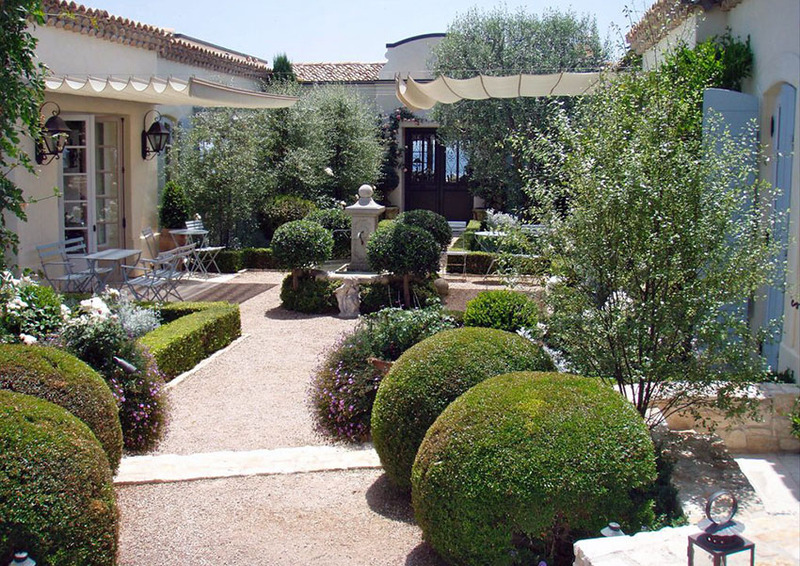 Below are the best materials to use for your paving stone patio and walkway projects. Visit our patio ideas page for additional designs. Brick pavers have an attractive appearance and are popular for driveways, walkways and patio designs. They come in various characters that can be set up in different patterns. These are used in patios as they are able to hold heavy foot traffic. The brick pavers are made in varied sizes, shapes, colors, and finishes making them appear old or new. For DIY installation, you will be spending $3 to $5 for each square foot. With this set-up, you will need to have a brick saw or rent one because it is a heavy table-mounted saw making the cutting masonry fast. This will cost you $60 to $95 daily. Keep in mind that you need to figure out the way of getting the brick saw to your home. A pro-installed brick patio that is being installed by a professional would cost $12 to $18 for each square foot. Large red brick patio design with wrought iron outdoor furniture. 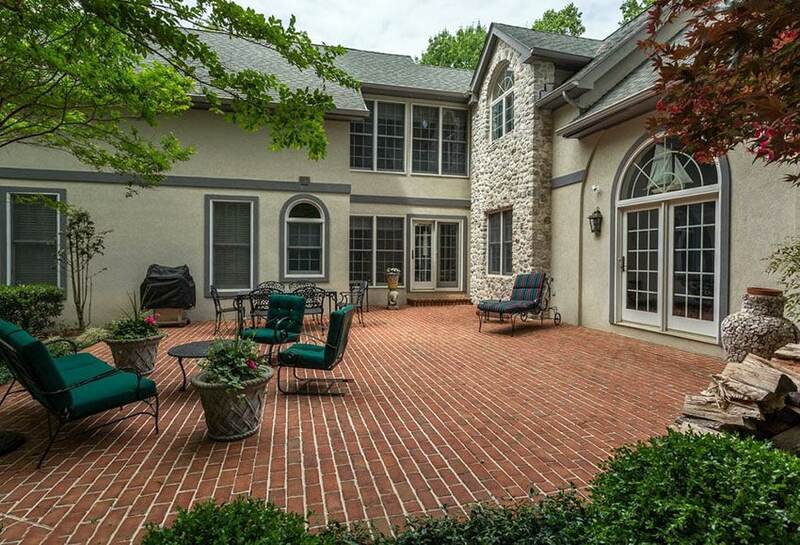 Curved brick patio design with brick walkway surrounded by lawn. 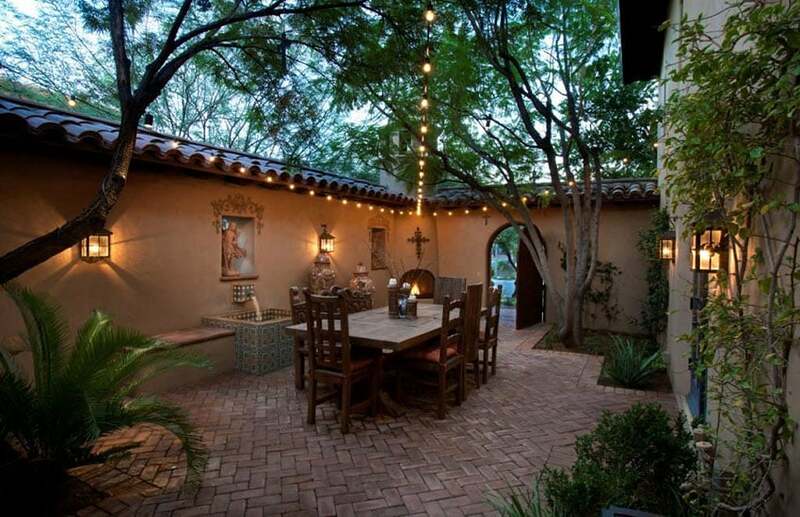 Mediterranean style patio with red brick flooring in a herringbone design pattern. Concrete can have finishes which can be created through brushing, adding acid, scoring, washing, and stamping of so many colors. It has become known for its long lifespan and inexpensive installation. Colder climates can spend $1 to $2 for each square foot for the specialized base preparation as well as for the concrete additive. 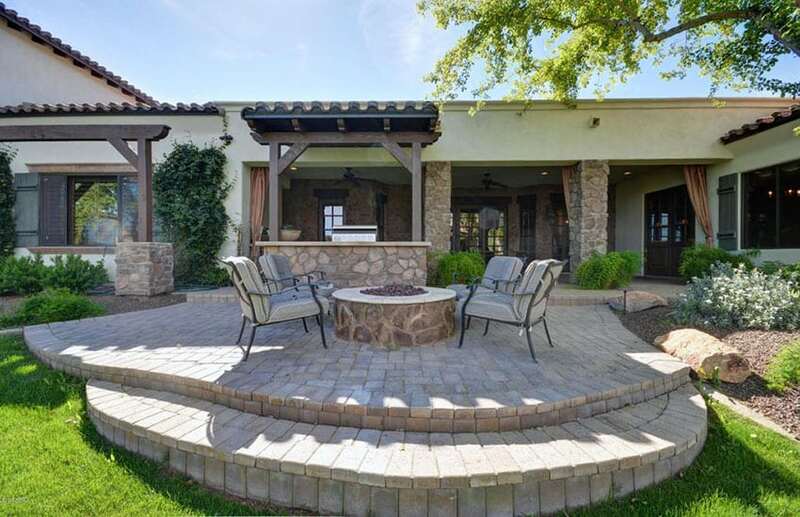 The stamped concrete stimulates the brick, flagstone, cobbles, or other decorative patterns but with additional $3 for each square foot for the cost of installation. 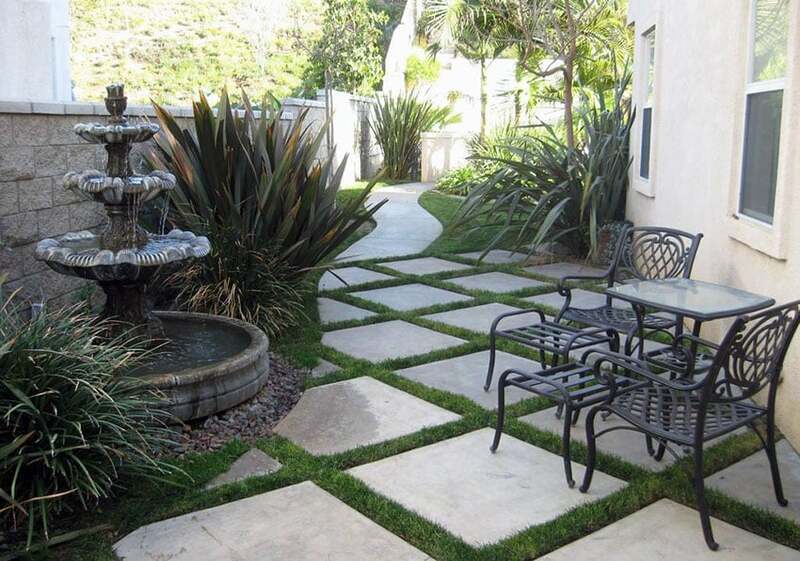 Attractive Mediterranean style backyard with gray concrete patio stones with grass border and outdoor fountain. 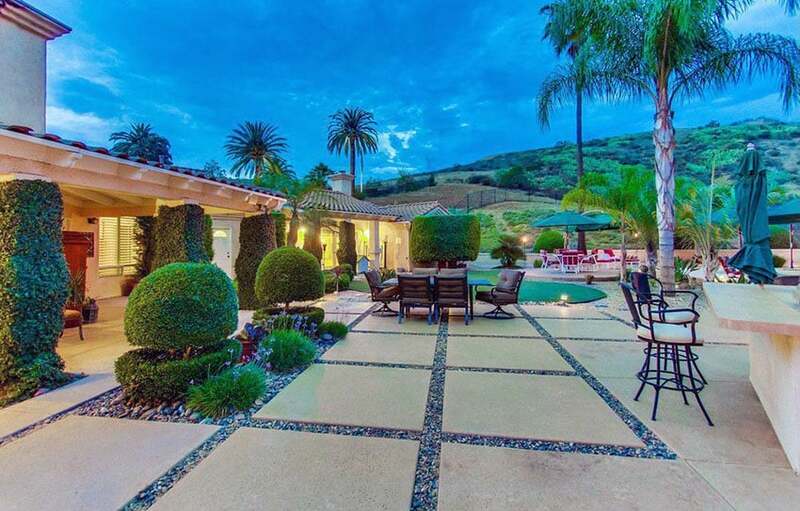 Beautiful luxury backyard with poured concrete blocks bordered by small rocks. These come in varied sizes, shapes, colors, and textures. They can appear plain, like real stones, or patterns which are embossed on the surfaces. These are available in home improvement centers and are ideal for DIY installation. The interlocking concrete pavers is like piece of puzzle as they have the slots and tabs that can fit together. An advantage of this is that is it not costly, has minimal maintenance, and can be installed fast. The cost is about $2 to $8 for each square foot. For professional installation, it would cost you $7 to $15 for every square foot and this already include the materials. 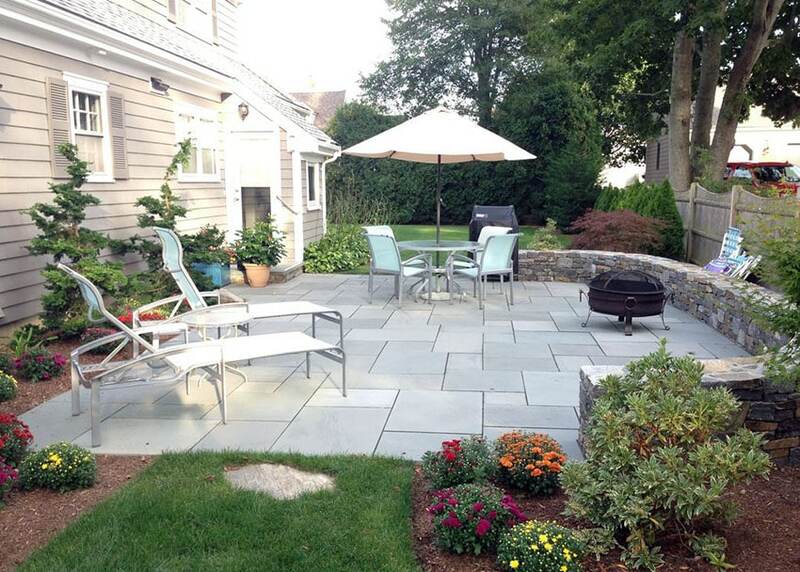 Concrete rundle stone paver patio with slate outdoor fireplace. 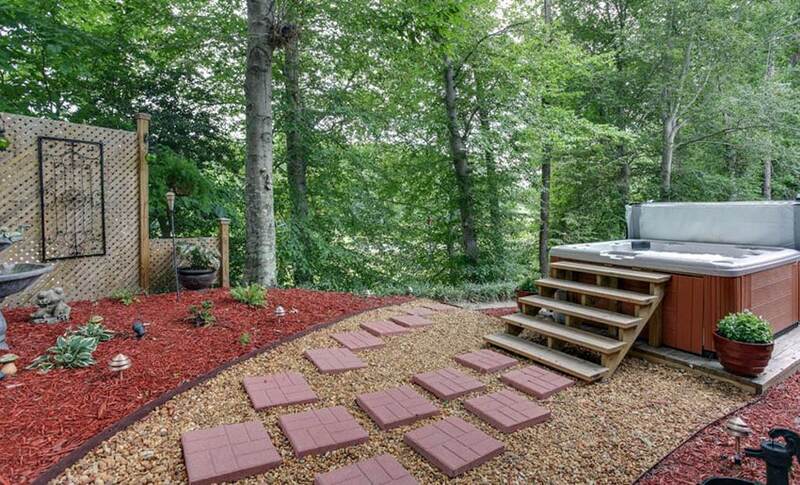 Cheap outdoor patio made from red stones constructed from concrete. Concrete stepping stones leading to a small stained concrete patio with a small firepit and outdoor seating. DIY stepping stone and grass patio for outdoor lounge area next to covered porch. Concrete paving block walkway leading through garden pergola with creeping vines. These kinds of stones are often used as a paver material. Keep in mind that you can get them at lesser cost when purchased at locally operated quarries. You may take into consideration of checking the local stone supplier prior to checking the national home improvement chains. The stone pavers are cut in standard sizes. The uncut pavers appear rough with irregular edges as well as different sizes. Installation of the uncut stone is best done by an experienced pro and this will cost $12 to $28 for every square foot. 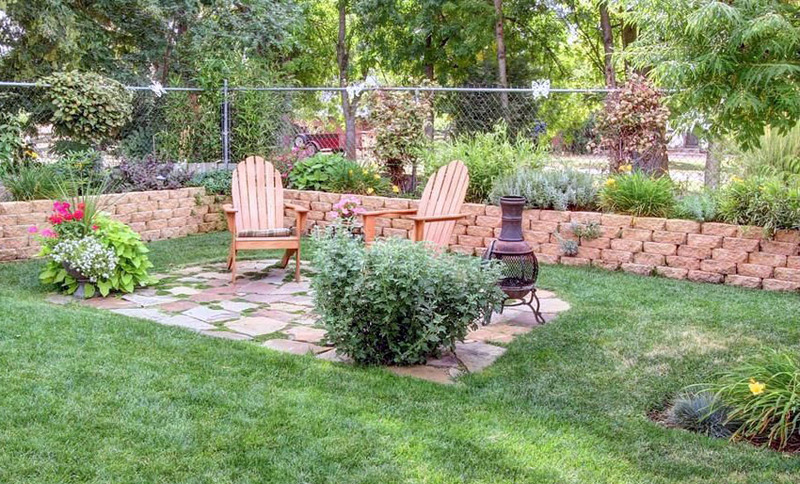 DIY patio with irregular flagstone paver patio to create a small outdoor sitting area. 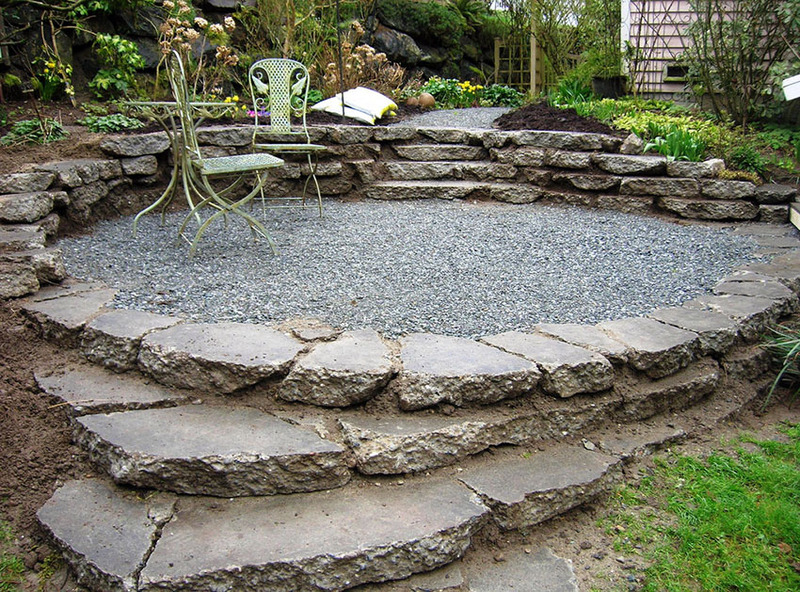 Large irregular cut flagstones for rustic patio with stacked stone bench. 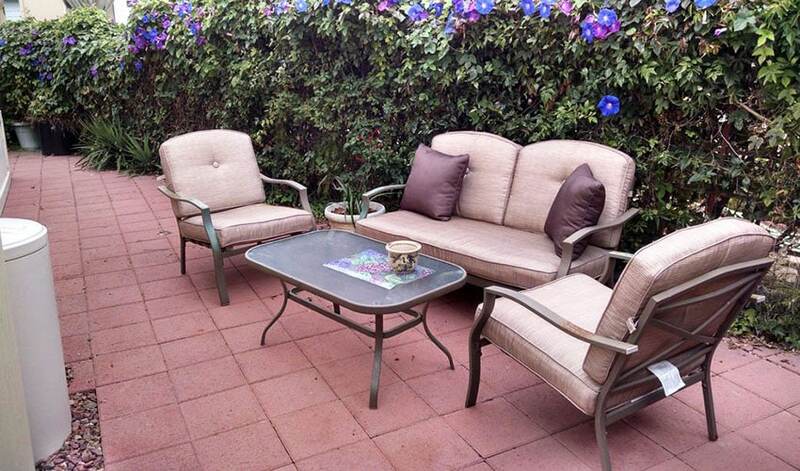 Attractive pattern slate patio with outdoor daybed and swinging chair. 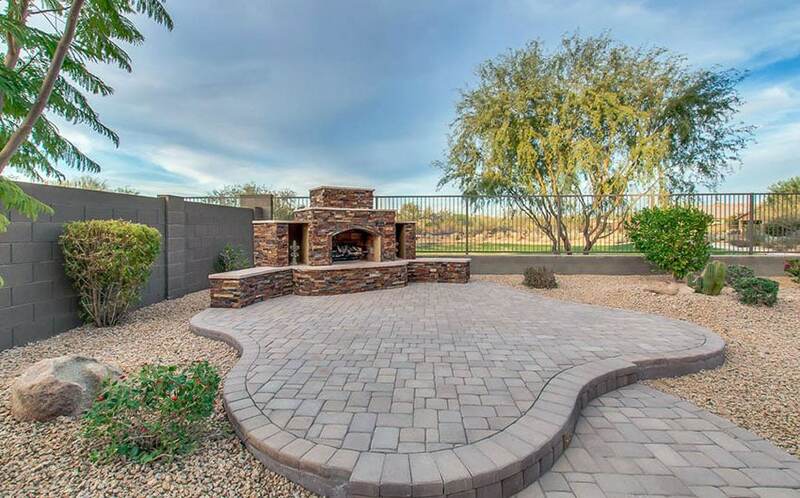 Marble paver patio with small rock wall and portable metal firepit. While not technically a paving stone, decomposed granite is commonly used with larger granite stones to create a rustic patio or walkway. Decomposed granite is made from small pieces of granite that range in size from 1/4 inch to the size like the sand. It is affordable. Its underfoot that has a slight crunchy texture is perfect especially at it produces no puddles as the rain disappears from it. The surface can erode with time so it is important to replenish the granite from time to time. The cost is $1 for each square foot every 3 years. Its appearance is not solid that the furniture legs tend to sink that is why it is needed to add stabilizers for surface strengthening. The cost is $1.50 for each square foot that has no stabilizer and $2 for those with stabilizers. 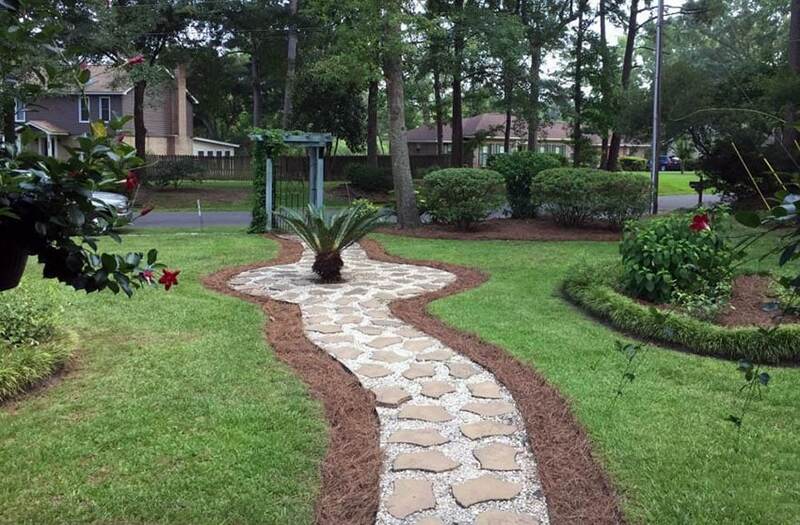 Decomposed granite walkway with poured concrete border with hedges and outdoor sitting area. Red patio stone walkway in a bed of pea gravel leading to hot tub. These are made out from the poly material or even from old recycled tires. Their design is made to be available for use in any surface. They can be used on decks because their weight is light. 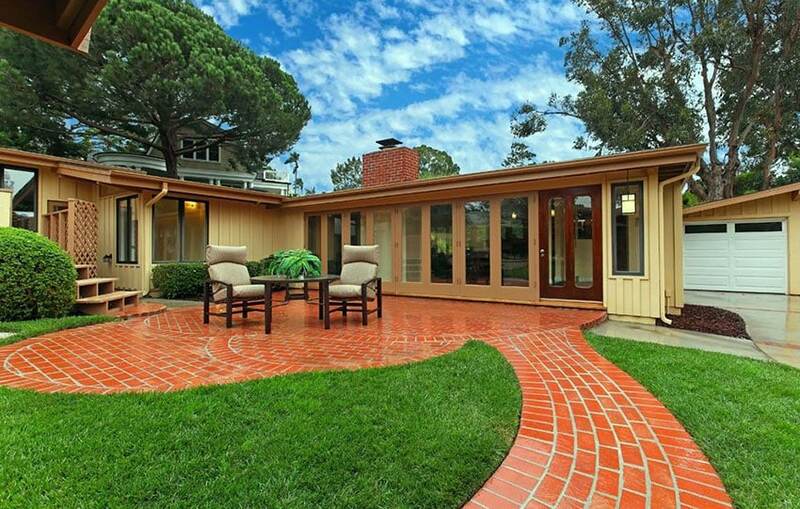 Their appearance resembles the concrete tiles and their finished is somehow like the terra cotta and brick. These materials are done by yourself and they snap together using the connector clips. They are best use to quickly cover the cracked, old, and worn patio surfaces. The cost for this is about $3 to $5 for each square foot. You can use recycled materials that have uniform thickness for an effective patio or walkway surface. One idea is to consider the cast-off concrete sections from the old driveway or sidewalk of the neighbor. The old materials from construction sites can also be used. Additionally, you can use any old brick or stone which has been discarded from any building that is scheduled for demolition. 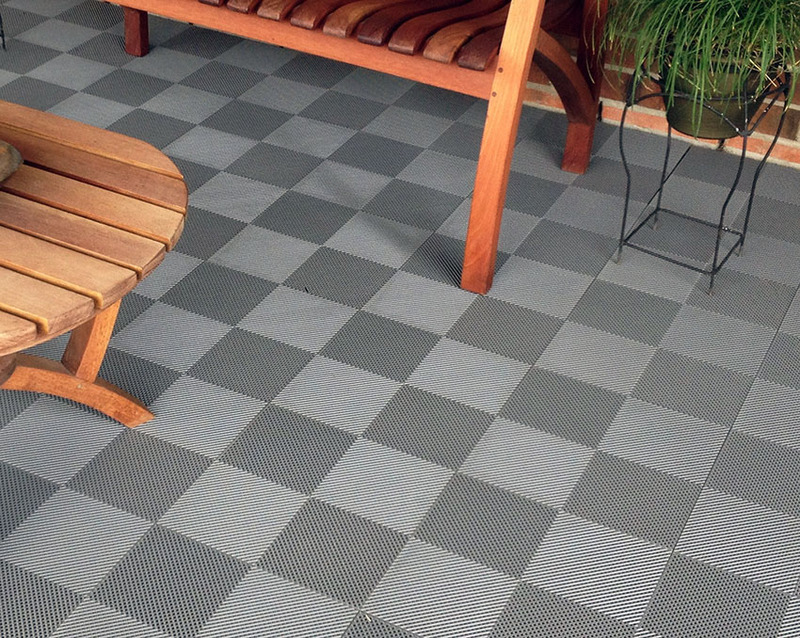 A typical 12×12 foot patio will save you $500 to $800 compared to buying new pavers. DIY recycled materials patio with construction remnant concrete blocks and loose gravel. To have a customized appearance of the patio, you can combine various materials like bricks with concrete or stone with rock trim. 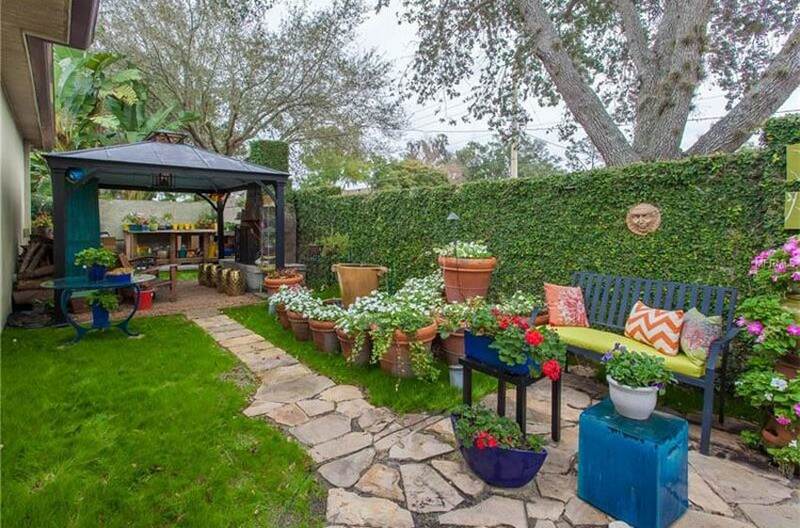 Mixed materials are frequently used by artists to create fanciful designs for their backyard patios. Mixed material patio with irregular concrete paving stones and small stones. 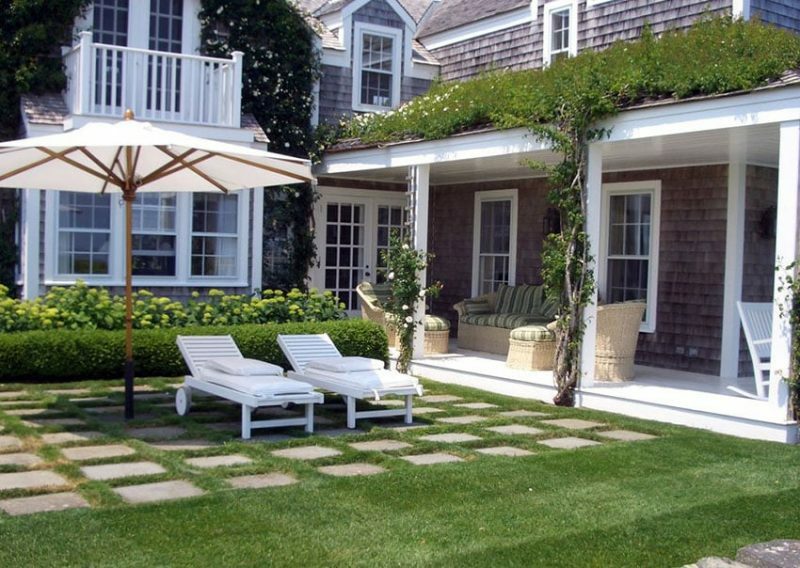 See more styles and patterns at our patio designs page. This rustic backyard showcases a simply designed flagstone walkway leading to a gazebo on one end and a small sitting area on the other. 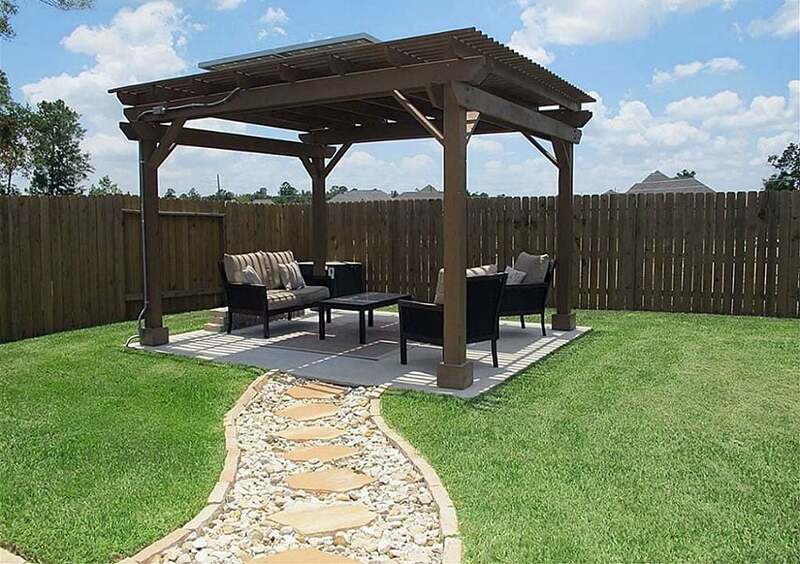 The gazebo design provides access to an outdoor fireplace for night time relaxing or as a shady spot during the day. DIY walkway constructed from tan concrete paving stones and white pea gravel. 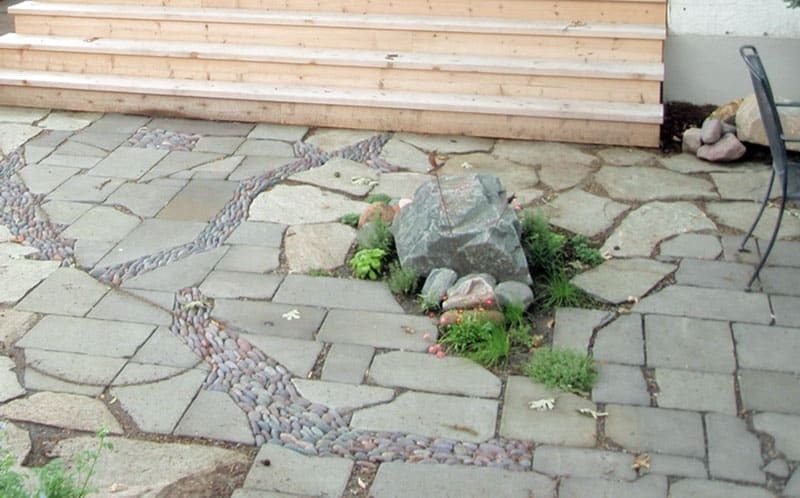 As with many paving stone ideas its easy to experiment with different positioning to get the design you want. Flagstone and river rock pathway leading to wood pergola over concrete patio with outdoor furniture. 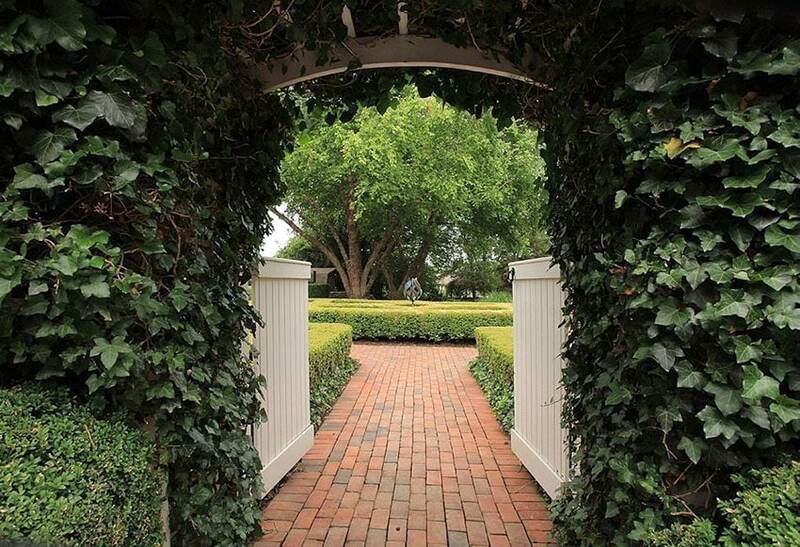 visit our gallery page for more walkway design ideas located here.